From the moment I felt the first movements of Pearce inside my belly, I knew I was going to have a child as wild and crazy as his father. He was always moving and super crazy when I was pregnant. Once Pearce was born and we had discovered that we had a boy, I knew he was going to be just like his Dad. This is where my story will begin. When I started dating Chris his mother, father and grandparents had told me a bunch of stories about how he was an escape artist, always getting out of bed and going outside to play in the middle of the night, or having to be tied to the tree when camping because he would run away. Well when Pearce was born he was just as eager to get on the move. He rolled over at 7 weeks, started crawling and 5 months and walking at 10 months. Basically since he could walk he could climb, it has been many months of owies, bruises, and little cuts all because our son is always moving faster than he can prepare for. A little over a month ago it was nap time and Daddy had a few of Pearce’s favorite friends over and Pearce didn’t want to nap, I put him in his crib and he climbed out immediately. This happened about 4 times before we decided okay its time to change his crib into the toddler bed. Pearce had escaped once or twice before this when he had woken from a nap but never like this. 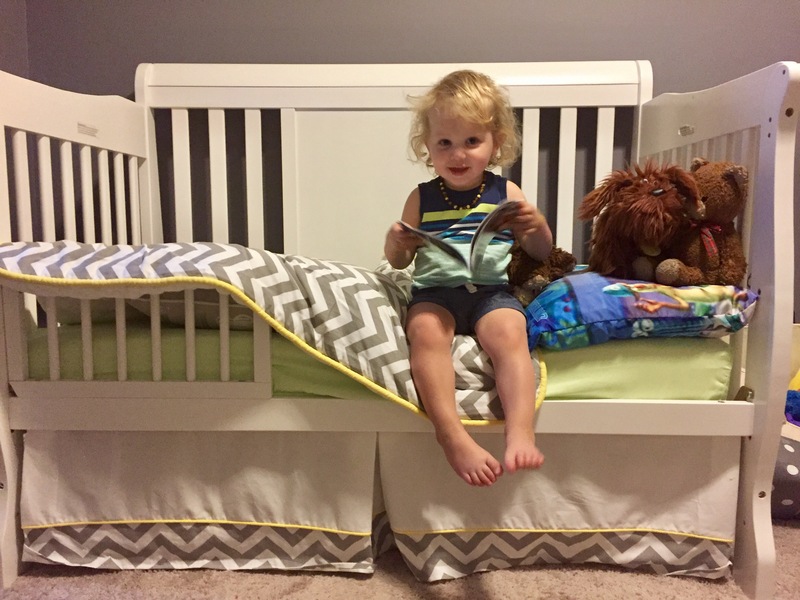 So Daddy and his friends adjusted his crib into the toddler bed. We attempted nap time again by putting Pearce in his bed and he climbed out and cried by the door, he ended up falling asleep by the door after about 20 mins and then I went in and moved him into his bed. For the rest of the week we kept Pearce up a little later at night so that when we would put him in his bed he would be tired. Bed time was a success and nap times got much better. After a month I can gladly say we have only had him fall asleep by the door 2 maybe 3 times and he has gotten into a few things. Yesterday he woke up from his nap while I was in the shower and when I grabbed him all of the diapers were all over his room, he sat there pulling them out individually from the plastic. For being so good at sleeping in his bed for the month I took Pearce to the book store, for him this is much more exciting than the toy store. Pearce picked out 1 book, much to my surprise he picked out a paper back book, it was the a golden book version of Moana, and for the last few weeks he has slept every night cuddling his Moana book. While we were away in Kelowna Moana hugely helped us get through our 7.5 hour drive home while the Coquihalla was closed. Make the bedroom safe, if your child can get out of their bed they can also touch everything in their bedroom so do a quick check to ensure its all safe! Putting your kid to bed when they are more tired will keep them from getting out of their bed. Ensure you have a guard rail, if your waiting for one to come in the mail, grab a large pillow and place it under a blanket and lay your child on top of the blanket. You may also find them sitting in their bed while you make dinner reading a book — this will melt your heart! I promise to share all the details of Kelowna, our Air B and B stay, the winery, the restaurants and all about Chris’s hockey tournament on an upcoming blog! How excited I am that Pearce has his big boy bed! One of my fondest memories is going to Christopher’s house especially at Christmas Eve, sleeping with Christopher in his Junior bed waiting to wake up for Christmas Day and Santa. I remember being admonished by Chritopher, close your eyes Mumma , Santa won’t come if you don’t . It wasn’t the most restful sleep but definitely memorable one! Wish I was there to share, love and hugs Pearce. From Nana!